Last weekend, I had the craving for having dosa. I used store bought dosa mix to make the batter and kept it in the oven overnight to ferment. On Saturday, I made dosa for brunch. 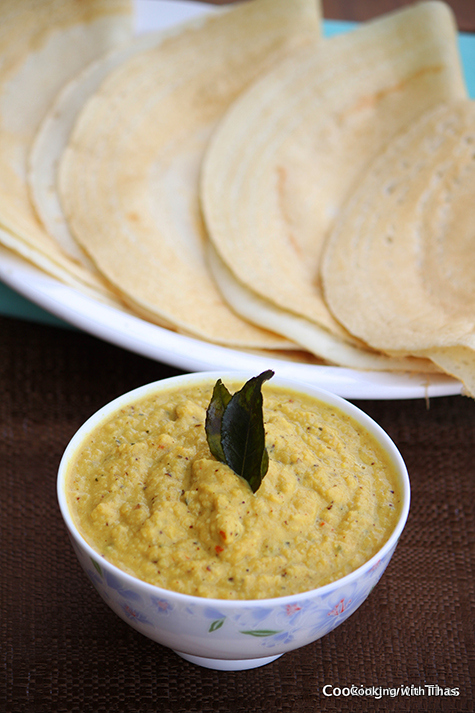 I wanted to make chutney to serve along with dosa and thought onion would make a good candidate for chutney. I wasn’t wrong, cooked onions along with coconut was made into a chutney. 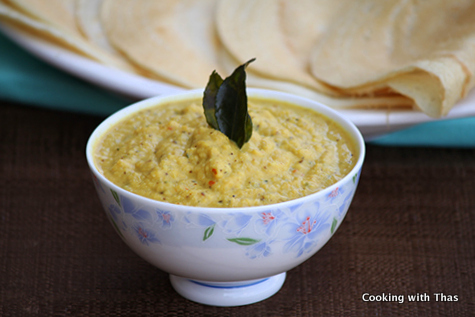 Tasted really good and a perfect chutney to serve along with dosa or idli. 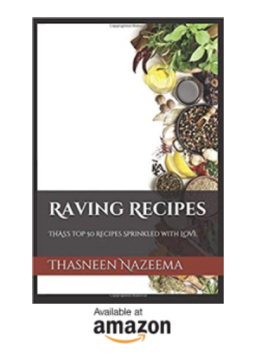 Other Chutney Recipes, click here. Recipe for making Idli, click here. Recipe for making Dosa, click here. Heat a saucepan over medium heat, add oil and let it turn hot. Add whole red chilies and curry leaves, saute for a few seconds. Add onions, season with salt and saute till onions turn golden in color. Add chopped ginger and grated coconut, saute for a few minutes. Add turmeric powder, chili powder, cumin powder, coriander powder and salt, combine well. Add more chili powder if you want the chutney to be spicy. Transfer the cooked onions and coconut into a blender, add ¼ cup to ½ cup water and puree to a coarsely smooth paste. Pour into a bowl and serve with Dosa or Idli.